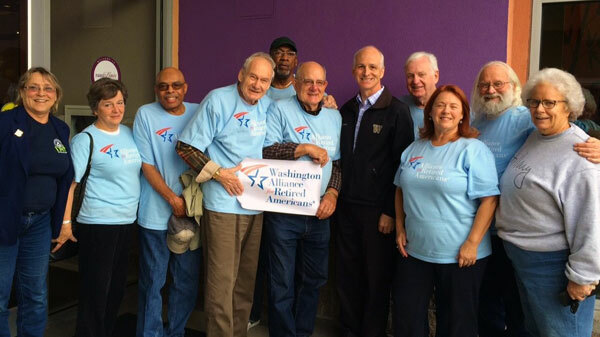 Rep. Adam Smith, middle in black, joins IAM members from the Washington State Alliance of Retired Americans. From left, Pam Harris (IAM), Gwen Rench (Retired Public Employees Council of Washington, RPEC), T.J. Seibert (IAM), Carl Schwartz (IAM), Claude Burfect (RPEC), Jim Hutchins (IAM), Rep. Smith, Ron McGaha (IAM), Jackie Boschok (IAM and Washington Alliance President), Don Bennett (Letter Carriers) and Kathy Wallentine (Washington Education Association). Rep. Adam Smith (D-WA) has earned re-election to the U.S. House of Representatives, say IAM and other union members in the Alliance for Retired Americans. Six retired Washington State Machinists recently had a conversation with Smith about the important issues facing working people and retirees. “He really listened and shares my concerns for future retirees,” said retired IAM District 751 member and former Boeing employee Pam Harris, who told Smith about problems young people like her daughter face in saving for retirement. Smith has a 91 percent lifetime voting rating from the Alliance, which advocates and mobilizes for retirees on Capitol Hill. He has consistently voted to preserve Social Security and Medicare, reign in health care costs and strengthen retirement and pension security. Smith is a co-sponsor of the Strengthening Social Act (H.R. 5952), which would gradually eliminate the Social Security cap on taxed income and correct the way cost-of-living is calculated for seniors. Where do your members of Congress stand on retiree issues? Check the Alliance’s Voting Record Database. The Alliance for Retired Americans represents more than 4.3 million retirees, older Americans and community activists in our country, including 83,059 members in Washington state.